Los Angeles, Calif. (August 1, 2017) — Discover science, candy, and awesome adventure in THE NOT-SO SECRET SOCIETY, the all-new all-ages graphic novel from BOOM! Studios, available now in comic shops and bookstores everywhere! The writing team of Matthew Daley (Lantern City) and Arlene Daley call on 25 years of combined education experience to create this thrilling coming-of-age adventure featuring five young friends inventing a candy-making machine for their school’s annual science fair…and unintentionally unleashing a colossal candy creation that could destroy the city! Co-created by Macrocosm’s Trevor Crafts (Lantern City) and Ellen Crafts, and illustrated by Wook Jin Clark (Adventure Time: The Flipside), The Not-So Secret Society is an all-ages adventure that celebrates the value of teamwork and lifelong friendships. This original graphic novel is supplemented by parent guides and educator guides (newly expanded for to celebrate the release) included in the book and more to be found online at www.teamNS3.com. To support the launch of this original graphic novel, the creators at Macrocosm will appear at a variety of upcoming Not-So Secret Society interactive events including signings, meet & greets, presentations on creating comics and special gummy bear raffles! The Not-So Secret Society is the latest release from BOOM! Studios’ KaBOOM imprint, home to popular all-ages series such as Steven Universe and Adventure Time, inspired by their respective hit animated series on Cartoon Network; Rugrats, inspired by the pop culture phenomenon from Nickelodeon; The Deep by Tom Taylor & James Brouwer, which has become a hit animated series on Netflix; Brave Chef Brianna by Sam Sykes & Selina Espiritu; and Mega Princess by Kelly Thompson & Brianne Drouhard. 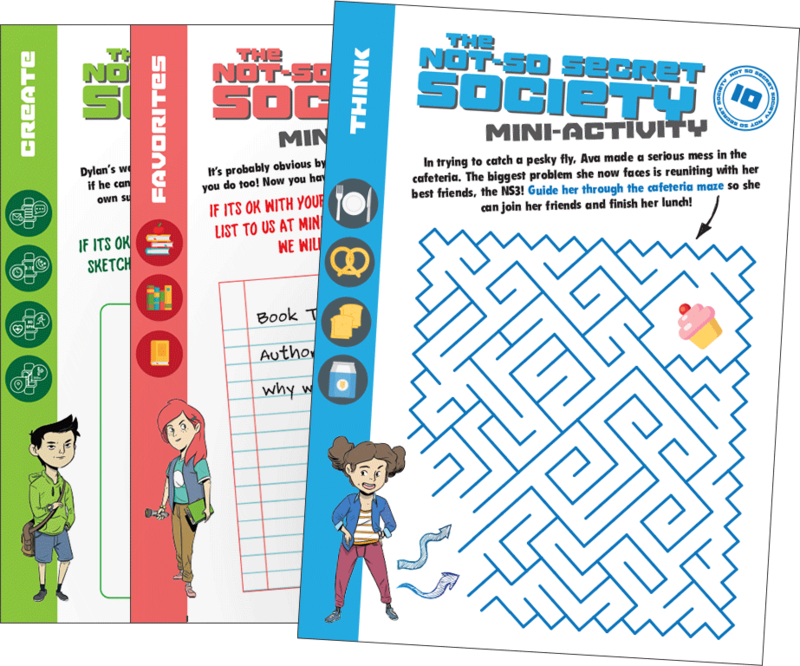 For more on The Not-So Secret Society check out www.teamNS3.com where you can get FREE downloadable activities for kids, parent and educator guides, information on upcoming live events from the creator team, and listen to the official theme song! Further information on BOOM! Studios can be found at www.boom-studios.com and on Twitter at @boomstudios. Further information on Macrocosm can be found at www.macrocosm.tv. Macrocosm (macrocosm.tv) is a new voice in transmedia entertainment. The award winning Macrocosm brings dynamic engaging content to global audiences. Films include the upcoming documentary on the origins of Sesame Street “Street Gang” and “Experimenter” a 2015 Sundance Film Festival hit and critical darling. Creator of “Lantern City” (lanterncitytv.com), Macrocosm published the illustrated novel “Rise” in 2013 and in 2014 partnered with BOOM! Studios, to create the “Lantern City” comic book series, one of UPROXX Top Ten Comics of 2015. Get weekly comics, activities, and updates. Your kids will thank you! 2019 Macrocosm Entertainment, Inc. All rights reserved.